The Asus Memo Pad HD7 Manual is available now. For owner of this tablet, you can download directly at asus official website. Many instructions or tutorial of this manual especially how to settings guide for the tablet. The Asus Memo Pad HD7 measuring 196.8 x 120.6 x 10.8 mm. It has 7.0 inches, IPS LCD capacitive touchscreen, 800 x 1280 pixels resolution and support 16M colors. There is 8/16 GB internal memory, 1 GB of RAM and support for externak memory up to 32 GB. The Asus Memo Pad HD7 tablet equipped with 5 MP camera and 1.2 MP secondary camera. The tablet runs on Android v4.2 (Jelly Bean) operating system and powered by Quad-core 1.2 GHz Cortex-A7 processor also MTK 8125 chipset. Other features and specs such as available 16 GB One Year ASUS Webstorage Space, support MP3/MP4, and powered by Li-Po battery (15 Wh) (Non-removable). 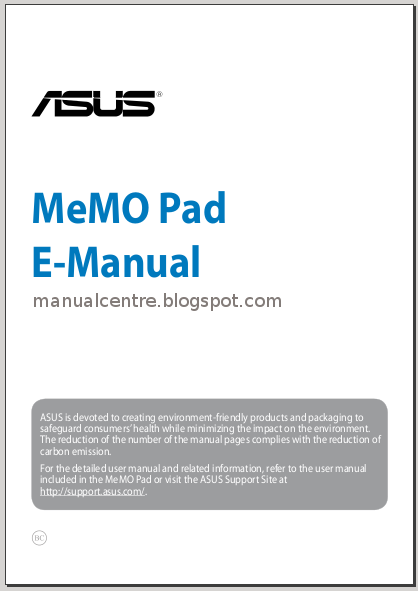 The Asus Memo Pad HD7 user manual consist of 106 pages with file size of 4.27 MB. It's devided into 4 section and available inn english language. In this manual you can find reference information such as tablet part overview, Setting up your MeMO Pad, Starting up for the first time, Android lock screen, Unlocking your device guide, how to Adding a wallpaper on the lock screen, using home screen, Connecting to Wi-Fi networks, Using Bluetooth, Pairing your MeMO Pad with a Bluetooth device, using apps like camera, gallery, email,Gmail, play store, maps, mylibrary, SuperNote Lite, ASUS Studio, ASUS Artist, app locker, app backup and more.